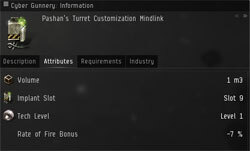 Where do the “Pashan’s Turret Handling Mindlink” and “Pashan’s Turret Customization Mindlink” implants drop? At the Rakogh Administration Complex DED 5/10 in 3GD6-8, last room off of the Citadel structure. Left side is unlocked, right side is locked. The Key to open up right comes from a Overseer spawn on the left side second pocket. 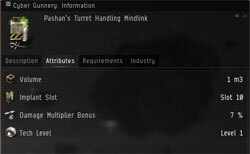 Find the Overseer here named Pashan’s Battle-Commander, should always drop a key named, “Rakogh Officer Gate” and a 19th Tier Overseers token. Use the Rakogh Officer Gate drop to go thru the gate to the cargo storage facility. Intel says NPC Overseer doesn’t automatically spawn right after downtime, you have to wait a couple of hours for it to show up. It appears to have a 4 to 6 hour respawn timer. Citadel once destroyed will not respawn until next downtime.